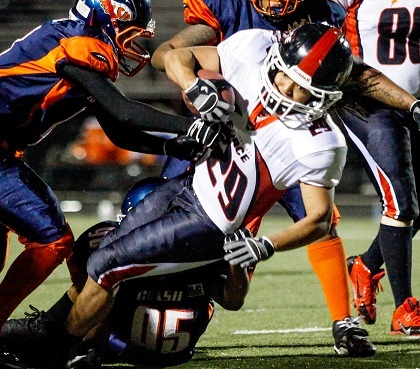 INDIANAPOLIS, IN: The Chicago Force clinched their division title last night with a convincing win over the Indy Crash 36-6 in Indianapolis. The Force offense seems to reinvent itself each week, this time winning with a balanced attack that featured both passing and rushing touchdowns. League-leading receiver Jeanette Gray has stepped into the interim quarterback role while star QB Sami Grisafe recovers from an injury she sustained in the game against the DC Divas. Gray completed 17 of 26 pass attempts for 119 yards and a touchdown. Indy's game-opening possession ended when Chicago safety Kayley Peterson had the first of her two interceptions on the day. Chicago then scored on a 10 play drive when running back Brandy Hatcher followed a sea of blockers into the end zone from the 1 yard line. The two point attempt was no good and Chicago led 6-0 just minutes into the game. Indy's next possession ended when their ball carrier fumbled and Force linebacker Darcy Leslie scooped up the loose ball and sped 47 yards to the Crash 2 yard line where she was tackled from behind. Hatcher again was escorted into the end zone by her offensive line and again the two point conversion was no good. Chicago 12, Indy 0 at 14:36 of the second quarter. Indy scored its lone touchdown at the end of the second quarter on a drive aided by two penalties against the Force. Indy QB Lea Kaszas then threw a 21 yard touchdown pass to Terri Abraham in the corner of the end zone. The two point conversion attempt failed. Chicago 12, Indy 6. Force kick returner Paula Lehtinen took the ensuing kickoff all the way back to the Indy 30 yard line, giving Chicago another chance to score with 1:45 remaining in the half. Quarterback Jeanette Gray connected with Courtney Cech for a first down completion to the 20 yard line. Moments later on the final play of the half, Gray was flushed from the pocket but scrambled to extend the play and found Cech in the end zone for TD reception that seemed to completely deflate the Crash. Brandy Hatcher scored easily on the two point conversion attempt and Chicago went into halftime leading 20-6. Chicago scored two more rushing TD's in the second half, both by Hatcher, as she finished with 26 carries for 126 yards and 4 touchdowns. The Force defense was opportunistic in getting two fumble recoveries and three interceptions - 2 by Peterson and one by Melissa Nelson. Rookie Amber Kimbrough continues to play well and led the defense again this week with 9 tackles, while Lehtinen added 6 tackles to the effort. Chicago remains undefeated at 5-0 and have clinched the division title. The Force have a bye this week before going to Pittsburgh on May 17th for a neutral site game against conference rival Boston Militia. The stakes are high as these are the top two teams in the conference and the outcome will determine hosting rights for the playoffs.